February « 2014 « Central Australian Art Society Inc.
Last March, the Central Australian Art Society proudly celebrated fifty years of exciting, diverse and distinctive art practice inspired by life in Central Australia. The gallery will be open as set out below. This is an invitation-only Opening. A voluntary-run organisation, CAAS was established by local artists in the early 1960’s to support the development of art and art practice, and provide local residents with the opportunity to participate in and enjoy a vibrant creative community. The signature event for over thirty years has been the unique and hugely popular Advocate Art Award, providing artists at all stages of their artistic development the opportunity to exhibit works in public and have them professionally appraised. 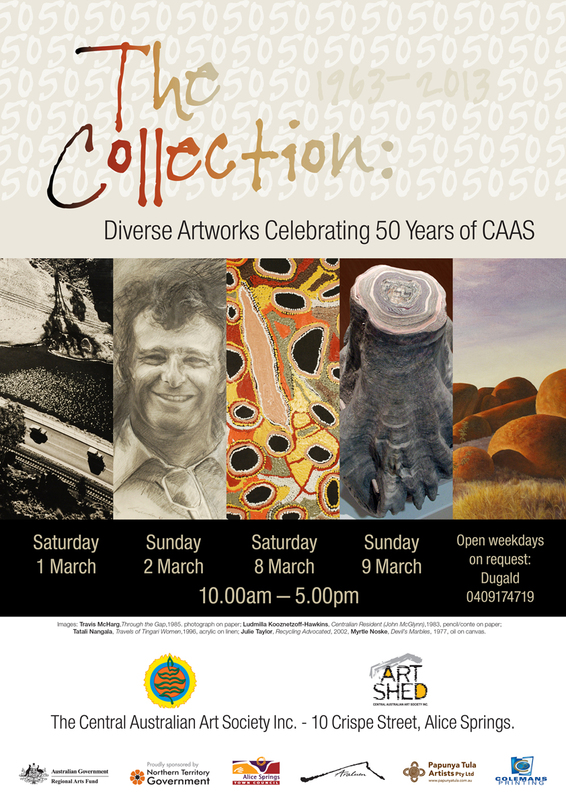 To mark the 50th anniversary year of CAAS, the Society is putting on an exhibition: The Collection: Diverse Artworks Celebrating 50 Years of CAAS. The exhibitions showcases 30 distinct works from the Araluen Collection, spanning the period 1973 to 2003 and explores the quality and range of Central Australian art practice over that time. “CAAS also demonstrates that here in Central Australia, art remains accessible. The Society is open to anyone with an interest in art, you don’t have to be a professional to join in and explore your potential”, she added. In putting this exhibition together we are extremely grateful for the help and assistance of the Araluen Arts Centre which is responsible for the storage and ongoing maintenance of the collection on behalf of the Alice Springs Town Council. We also acknowledge the Australian Government’s regional arts program: The Regional Arts Fund, which provides all Australians with better access to opportunities to art practice and experience of the arts. The Collection: Diverse Artworks Celebrating 50 Years of CAAS opens to the public at our Crispe Street premises in Alice Springs at 10am on Saturday 1 March, and runs between 10am and 5pm on weekends until Sunday 9 March, when there will also be an opportunity to hear some of the featured artists talk about their works between 2pm and 4pm. Photos from the Opening will appear on our linked Facebook page. Opening night photos here on Facebook.